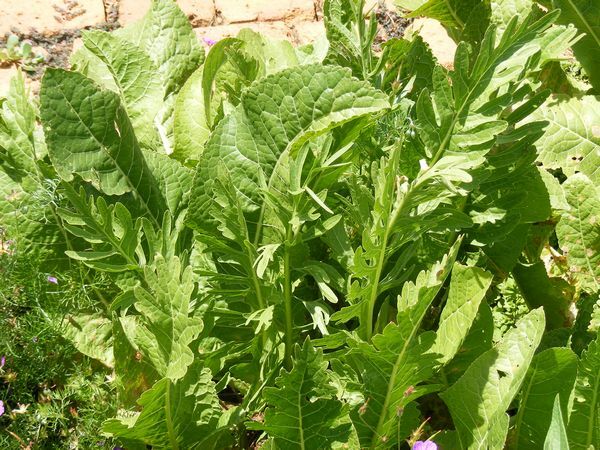 Upright perennial, thick taproot and broad, oblong serrated leaves. Bears tiny white flowers in terminal racemes in early summer. Plant it in a sinked basin in the ground - difficult to eradicate when established because bits of root left in the ground grow into new plants. Grate taproot using a food processor to prevent your eyes watering. Discard central core, grate only the amount needed. H/R sauce made with milk or oil and vinegar - traditional condiment for roast beef, smoked fish, asparagus. H/R cream: Fold into whipped cream, yogurt or sour cream and season with salt, sugar and a little vinegar. Don't grate until just before serving or it will loose it's flavor. Serve with ham, on baked potatoes or cold meats. Add grated H/R to coleslaw, dips, sauces, pickled beets, cream cheese, mayonnaise and avocado filling. Blended with butter and chilled - an alternative to garlic butter to accompany grilled steak. 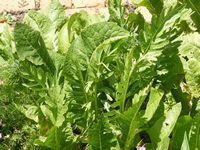 Crushed young leaves have a mild pleasant flavour - add to salads and sandwiches. Use older leaves in sauces and curries. Roots - lifted autumn. Store in damp sand. Wrap in paper bag - stay fresh for about 2 weeks in fridge. Freeze grated root in polythene bags, use as required. Grate into white vinegar (red wine or cider vinegar discolors the root). Richer in Vitamin C than lemon/orange. High levels of sulphur, potassium. Digestive, diuretic, controls bacterial infections. Sciatica, urinary infections, respiratory and circulatory stimulant, expectorant with antibiotic properties. Ointment with the root for arthritis sufferers. Immediate relief to blocked sinuses - snuff finely grinded root - start with a very small pinch. Not given to patients with kidney or thyroid problems, stomach ulcers. Avoid continuous large doses when pregnant or suffering from kidney problems. Root: Slice, infuse in milk - lotion to improve skin clarity. Express juice, mix with white vinegar - use to lighten freckles. Improves the disease resistance of potatoes. Root: Infuse, dilute 4 times and spray apple trees against brown rot. Leaves: infuse and spray against brown rot, mildew and fungi development on pumpkin, roses and bergamot. De-wormer for dogs, to improve body tone: Add ½ -1 tbs. grated horse radish to their food. / Leaf: Chop finely into dog food.